Each time we dig through bags and boxes to unearth whatever we need next, we are reminded of the volume and energy our stuff consumes. Because of that, every item we carry must serve a purpose in order to continue the journey. There are no redundancies, and we try to get full use out of everything we have. “The kitchen” — stove, plates, pot, cups, utensils, and cutting board — packs up into one carry-on roller bag. I’ve actually been having a lot of fun cooking within these restraints. At mealtimes, I find ways to systematically cook in our single small pot atop a high-efficiency gas camp stove. The fuel is contained and finite. I can feel the canister emptying with each use. Camping in our little car with our little one-and-a-half-person tent has made me think harder about getting the most from our food and equipment. I like this challenge — and I know we are lucky to choose to undertake it, rather than being forced into it by budgetary limits. I’ve arrived at the camp stove and my culled supplies with over a year and a half of intentional practice trying to do more with less in the kitchen. The shift began when I read a chapter in my beloved copy of Tamar Adler’s An Everlasting Meal titled “How to Catch Your Tail.” In it, Adler poetically prescribes all sorts of second lives for leftovers we often deem as scraps: you can turn bones into broth, orange peels into marmalade, and stale bread into breadcrumbs. Since reading about “catching my tail,” I’ve been trying to use every bit of the foods I buy. Cooking on the road out of a small car has made it imperative. This type of thinking has already gained traction with nose-to-tail butchery, in which every part of the animal is used. Why not nose-to-tail, or rather, stem-to-end veggies? Use your veggies from stem to end. With this awareness, I began saving skins, stems, and stubs to make flavorful vegetable stock out of items that would normally be chucked in the compost. I made more of an effort to buy veggies that typically come to us trimmed and manicured. With the wisdom of how to put the undervalued veggie bits to good use, I unlocked what feels like a bunch of buy-one-get-one free deals on my produce. The carrot has been a central symbol in these efforts. 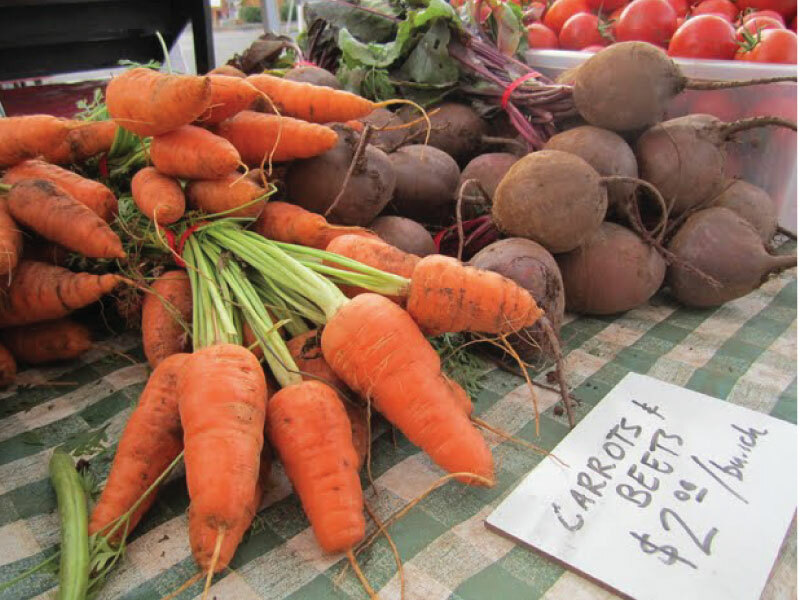 Picture a whole carrot — leafy green tops, skins, and root ends intact. Now picture a more familiar form — a bag of baby carrots or even whole carrots sans green tops. We typically purchase carrots that are missing at least two-thirds of their nutrient and flavor potential. Tamar Adler inspired me to use every part of the carrot. First, I tried the tops. After I first bought carrots with their tops at the grocery store, I quickly learned to stay alert. Had I not been ready to interject before the conveyor belt delivered the carrots into her hands, the cashier would have twisted off and trashed the precious greenery in one swift, subconscious movement. Once home, I washed my rescued parsley-like tops, rough-chopped them, and ground them to paste along with olive oil, toasted nuts, garlic, a handful of basil, and salt in batches in my mortar and pestle (food processor works, too). I stirred a cup of parmesan cheese into the earthy, garlicky sauce to complete the carrot-top pesto. Second, I found use for the too-tough carrot top stems and stubby ends. I saved them, along with onion skins and herb scraps in a container I kept in the fridge and added to throughout the week. Once it was full or when I had time — whichever came first — I threw the contents in a stockpot along with a bay leaf, some peppercorns, and a sprinkle of salt, and filled the pot with water. Simmered for 30–60 minutes and strained, this became versatile vegetable stock. There are endless variations — this method can put old parmesan rinds or last night’s chicken bones to good use, too. And finally, there’s the skin. I stopped peeling carrots after I skipped the step one meal and realized nothing was that different. I find that a good scrub to remove dirt from carrots grown without pesticides is plenty for most of my purposes. Some folks find that the skin adds bitterness, while others like the additional kick of fiber. Try it yourself and see where you land. Balance any bitterness with something sweet like honey or maple syrup or something acidic like citrus or vinegar. What we can learn from the carrot’s own resourcefulness. Carrots are also the perfect veggie to reference when discussing resourcefulness because of what happens if you leave them out in the cold. 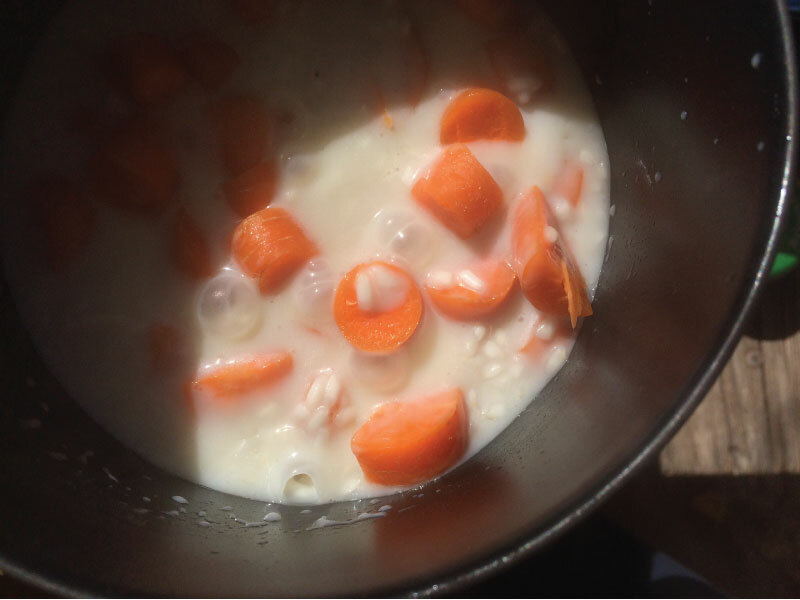 When you put carrots under the stress of freezing temperatures, a survival mechanism kicks in that converts starches to sugars. The sugars protect them from freezing, and they happen to become sweeter, crispier, and more nutritious as a result. The carrot maximizes what it has to create something tasty and nutritious. That’s exactly what I’m advocating for in our home kitchens. This philosophy extends beyond the single ingredient and to the whole farm. The first plate is from over a decade ago: a seven-ounce corn-fed steak with steamed baby carrots. The second plate represents the shift led by the recent farm-to-table movement: grass-fed steak and heirloom carrots grown in organic soil. The third plate offers a look into the future: a slab of carrot “steak” with a sauce of braised second cuts of beef. The whole book criticizes of the farm-to-table movement — one that Barber had championed — for touting “cream crops” like asparagus which remove nutrients from soil and are expensive to grow, and paying no attention to rotational crops like buckwheat which are required to replenish the soil’s nutrients. Barber argues that we cannot simply eat one product from a farm. We must support and utilize the whole ecological system. I believe this applies to many dimensions, all the way down to the carrots tucked in the crisper drawer of your fridge. We cannot afford to use one part of a vegetable. We must utilize every tasty, nutritious, and useful morsel of it. Practice this in your own kitchen: use every part. Start a scrap container in your fridge and make a skins-and-stems vegetable stock like I outlined above. Throw in any or all of these: garlic and onion skins; herb stems; mushroom pieces; hard cheese rinds; meat or fish bones; carrot, celery, and onion stubs; and anything else that still has flavor to give. Learn about the farm systems in your area by visiting or talking to a farmer. What cover crops do they grow that they can’t sell due to lack of demand? Show interest in cooking with those crops — it’s a small step, but that’s how markets start. Consider a volunteer shift at an organization that redistributes leftover foods to people who will utilize them. In Portland, we have Urban Gleaners. Perhaps there’s a similar operation near you. If you liked these stories, you might really enjoy my offering in partnership with The Recipe Hunters, Heirloom Mail. It’s a monthly “food learning adventure in a box” that highlights one handpicked (surprise!) ingredient with art, stories, and cultural wisdom behind it. You’ll learn and grow as a home cook, one ingredient at a time. Check out more details and subscribe here.